In the long term, well over 1.5 million people will live and work in the new Western Parkland City. 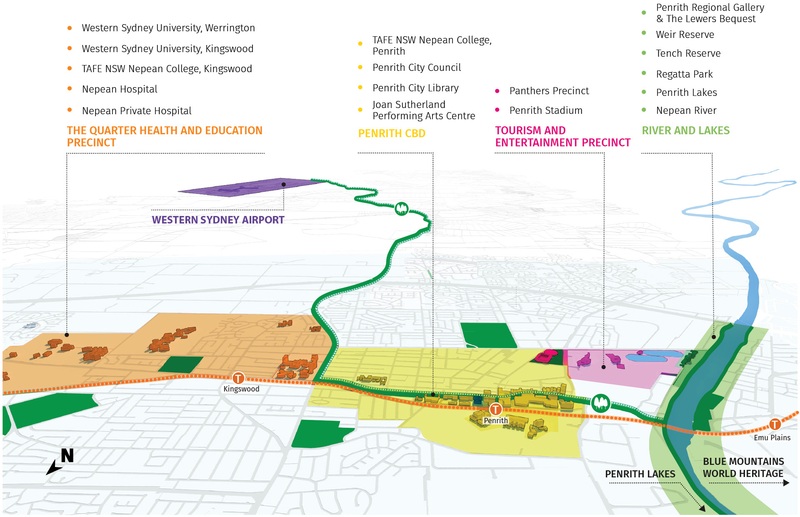 Mass transit connections to existing strategic centres, the Western Sydney Airport and Badgerys Creek Aerotropolis will act as economic catalysts, stimulating activity across the city with South Creek providing a green spine to improve amenity and environmental outcomes. The Western Sydney City Deal, a collaboration across three tiers of government, will drive the delivery of the Western Sydney Airport and Badgerys Creek Aerotropolis. sustainability, liveability and place making are core considerations in driving productivity and in delivering Greater Sydney’s first 21st century city. The emerging new city will be driven by economic opportunities created by the Western Sydney Airport and Badgerys Creek Aerotropolis and significant population growth, which will bring city-scale infrastructure and new advanced manufacturing, logistics and research industries providing hundreds of thousands of jobs over the long term. design and manufacture of defence systems for guided missiles, sonar and unmanned vehicles. Western Sydney is home base for significant Australian Defence Force capabilities, including the RAAF Heavy Air Lift Group and Australian Army Special Forces. This concentrated presence means the region is home to a large number of defencecapable companies and organisations, including numerous prime contractors. The Australian and NSW Governments have come together with local governments and agreed a set of commitments that will unlock opportunities in education, business and employment of the Western Parkland City and its people. The Australian and NSW Governments both have plans for managing growth and delivering infrastructure in our cities. 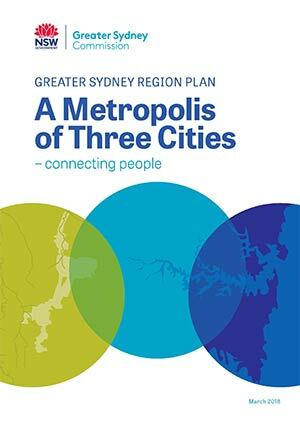 The Western Sydney City Deal delivers on Smart Cities Plan and the Western City District Plan. The Australian Government’s Smart Cities Plan is based on three pillars: Smart Investment, Smart Policy and Smart Technology. 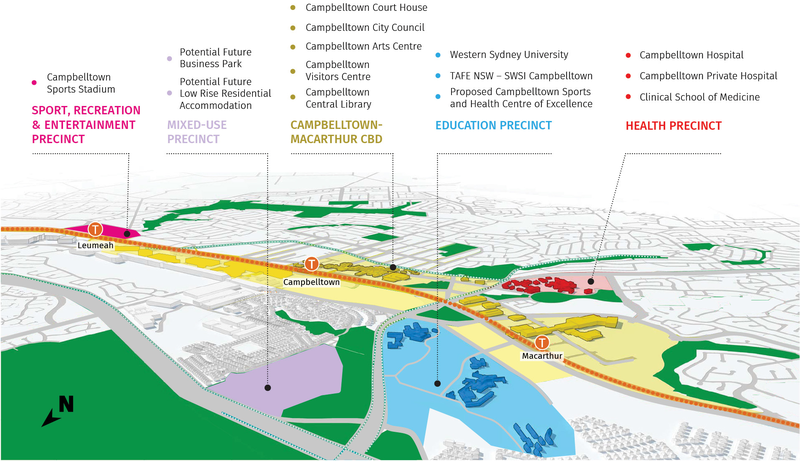 The Western Sydney City Deal includes six commitments: connectivity, jobs for the future, skills and education, liveability and environment, planning and housing and implementation and governance. delivering for the Western Parkland City with enduring tri-level government. Western Sydney Airport will trigger regional-scale growth in these industries, given the availability of land, skilled labour, research and development opportunities and key transport linkages. There is capacity to grow more high-value, tradeable jobs and further develop globally competitive capabilities in skills and technology. The NSW Department of Industry is leading the development of a world-class aerospace and defence industries precinct adjacent to the Western Sydney Airport. It will entail the physical and virtual cluster of the aerospace, defence and related industry businesses, research and development facilities and training institutions. It will be an advanced technologies hub, with horizontal capabilities (information and communications technologies, data analytics, cyber security, advanced electronics, advanced manufacturing and systems integration) across both the aerospace and defence sectors with the potential to expand to other sectors. A feasibility study has projected that the precinct could create approximately 5,000 jobs and over $15 billion of gross value added over the next 30 years. In May 2017, a leading global security company committed to a $50 million investment in a new advanced defence electronics maintenance centre in the precinct. This is the first of a range of businesses expected to establish a presence in the precinct. The commitment of $5.3 billion of funding by the Australian Government in the 2017–18 Budget to build the Western Sydney Airport by 2026 has positive implications for precinct. The development of the precinct will align with this schedule to leverage the once-in-a-generation opportunity of the new airport. It represents a critical economic growth opportunity for the Greater Sydney Region. The RAAF Base Richmond Precinct will complement the airport and aerotropolis activities. Precinct activities include aerospace activities (defence and civilian); a Western Sydney University campus, TAFE NSW Richmond and a range of equine activities. As low value-added manufacturers move offshore, the Australian manufacturing sector has been transforming with growth in the advanced highvalue sector. The expanding sector is characterised by significant investment in innovation, research and development as well as the use of technology and the production of goods that have a relatively high value. The research and development component includes opportunities to work closely with universities. The Western Parkland and Central River cities are manufacturing leaders in NSW, with well-developed specialisations in advanced manufacturing. The Western Sydney Employment Area immediately to the north of the Western Sydney Airport was created to act as a long-term metropolitan land supply for industrial and employment activities. Its significance has been enhanced with the commitment to the Western Sydney Airport. The potential Western Sydney Freight Line will enhance the connections between this area and the existing metropolitan significant Wetherill Park to Villawood industrial corridor. The existing freight and logistics activities of the Western Parkland City will be boosted by a number of transport initiatives which will significantly improve the accessibility of the Western City with other parts of Greater Sydney and regional NSW. These initiatives include the Western Sydney Freight Line, the Outer Sydney Orbital and a potential new intermodal terminal. Agribusiness opportunities will be supported by the allocation of land within the airport precinct for agricultural export logistics – improving links to new markets. The State’s premier quarantine and biosecurity facility, Elizabeth Macarthur Agricultural Institute at Menangle, will play an important role and increase opportunities for agriculture research and education jobs. enable a university at Badgerys Creek Aerotropolis to be anchored around the development of airport-related industries such as defence and aerospace, avionics, cyber security, food manufacturing and advanced manufacturing. New University of Wollongong, Liverpool campus. Significant land release development is still to occur along the South Creek corridor. People will live in and around new centres along the length of South Creek and its tributaries, providing a high level of liveability in a quality urban environment adopting best practice from cities around the world. High quality living will attract and retain businesses, skilled workers, international and domestic clients, students and service providers. The first stage of a North South Rail Link will support the delivery of a Western Economic Corridor (refer to Objective 15). It will connect the Western Sydney Airport and Badgerys Creek Aerotropolis as well as the Sydney Science Park to St Marys, and potentially to Marsden Park and Rouse Hill in the north and to Oran Park, Narellan and Campbelltown-Macarthur in the south and create opportunities for new centres. Liverpool, Greater Penrith and CampbelltownMacarthur centres will be better connected to the rail network and will leverage the associated benefits to drive their education and commercial strengths. New east-west mass transit corridors will better connect neighbourhoods in the Western Parkland City to the existing rail lines. South Creek and its tributaries will underpin the sustainability features of the Western Parkland City, from tree canopy cover to cool and green the city, to water sensitive urban design. 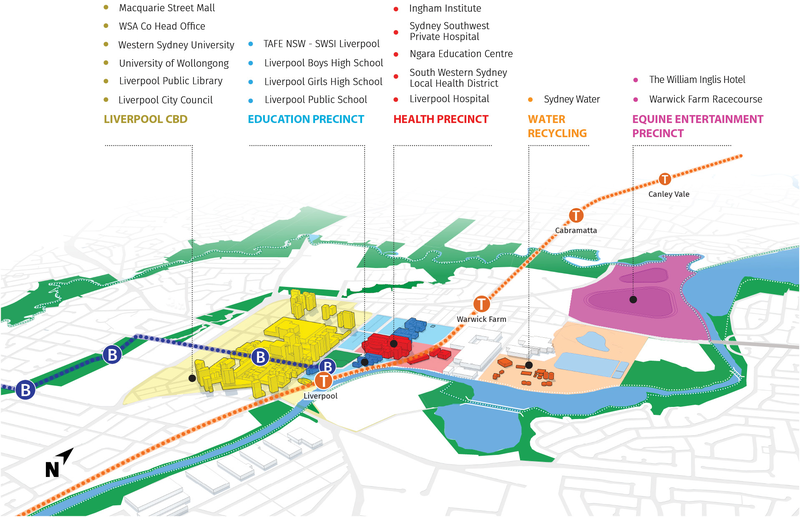 South Creek will form the central organising design element when planning new neighbourhoods. New centres, neighbourhoods and inclusive places will be integrated with the South Creek parkland. Place making along mass transit corridors will deliver walkable, cycle friendly neighbourhoods. Long-term transport and infrastructure corridors such as the Outer Sydney Orbital will be planned and integrated into the long-term vision and protected as required. Detailed decisions on the alignment of roads, mass transit and urban development are important to long-term economic prosperity and liveability. The early adoption of planning principles to inform these decisions will be critical. Objective 26 provides initial principles for the development of South Creek. infrastructure investments, particularly those focused on access to the transport network, which enhance cycling connectivity within 5 kilometres of strategic centres or 10 kilometres of the metropolitan cluster. improving transport connections across the Western Parkland City. The NSW Government, the Australian Government and eight councils to continue collaborating to deliver the Western Sydney City Deal. The City Deal will be accompanied by a draft Structure Plan that will indicate potential land uses for the Western Sydney Airport Growth Area. An Implementation Plan will be prepared in 2018 and will build on the commitments outlined for the six areas of connectivity, jobs for the future, skills and education, liveability and environment, planning and housing and implementation and governance.